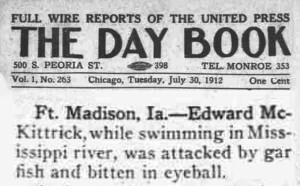 Browsing old newspapers for interesting fish stories, I uncovered a very brief item of massive importance and interest. That this has remained hidden so long may be evidence of a cover-up (though there is, as yet, no way to know how high this goes). 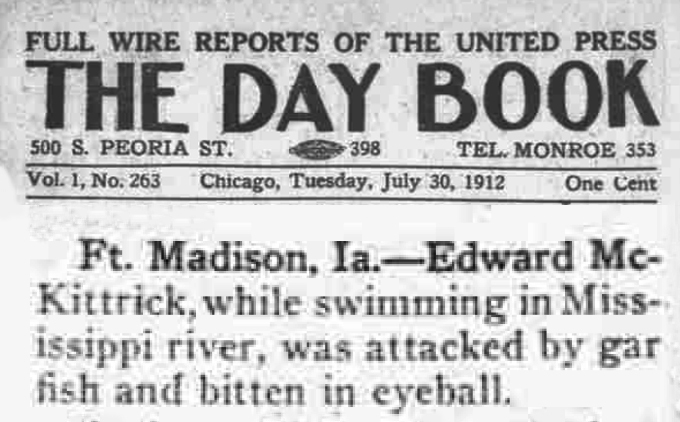 There are, in this single sentence, more stories than young Edward himself might have wanted us to find. If you have ever seen Jeremy Wade get so worked up over the potential implications of a few sentences of rumored fish-driven carnage that he can spin an entire episode of River Monsters from it before (usually) deciding either that the damage was done by something other than a fish or that it never happened at all, then you know how quickly a story can grow. This troubling news item is the same. Was he really swimming? Did he fall in, or was he pushed? Was it really a gar? Could it have been a submerged stick? What was Edward McKittrick hiding? Who has worked so hard to keep it hidden until now? 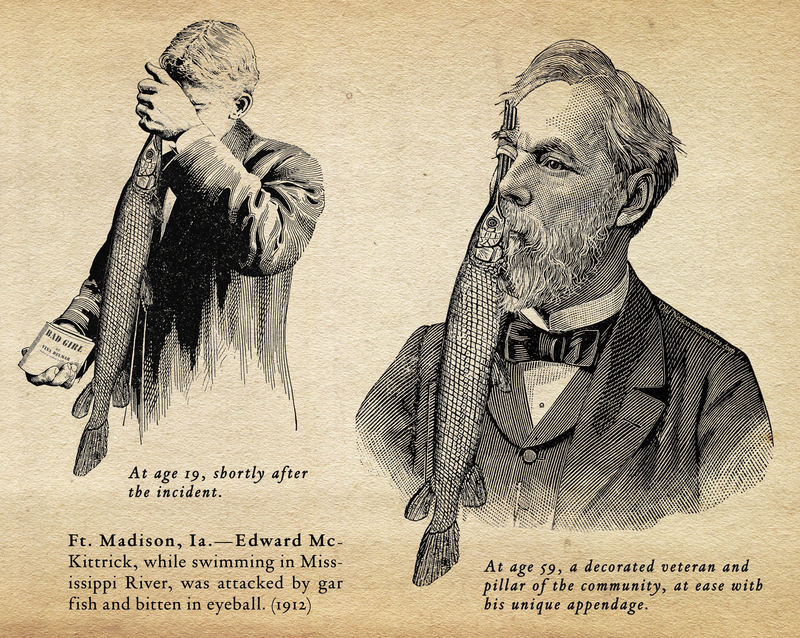 As a public service, I present an artist’s rendering of Edward McKittrick at 19, shortly after his encounter with a vicious Mississippi River gar, and later, when he was a respected pillar of the Fort Madison community. You’re welcome. Artist’s rendering of young Mr. McKittrick (age 19) and a respected leader of the community. I am surprised I have to say this, but messages and comments about the severity and/or impossibility of the injury indicate it’s necessary: I made this illustration. Yesterday. 104 years after the news item was printed. There are no illustrations of the real guy or the real gar. I thought it would be obvious. I mean, who wears a live gar in his eyebrow for 30-40 years? * I did a little research and found out more about Mr. McKittrick. He registered for the draft for both World War I (when he was 24 and already in the ROTC) and World War II (when he was 49). His WWI draft registration card specifically says he has all his limbs, eyes, etc., but does not mention the gar. He may have been in the infantry during WWI, but appears not to have been deployed outside the US. He was stationed at Ft. Snelling (MN) after he enlisted in 1917, and rose from the rank of Private to 2nd Lieutenant at the time of his discharge in 1919. He died in California in 1966. Tagged gar, injury, iowa, lepisosteus, longnose gar, mississippi river, old books, prejudice, shortnose gar, voracious.